Form 4689 or the "State Tax Commission Request For Changes In Personal Or Employment Information For A Certified Assessor" is a form issued by the Michigan Department of Treasury. 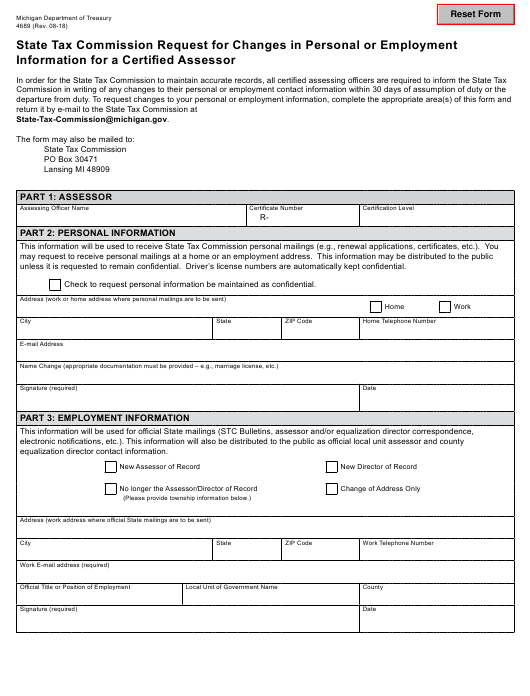 Download a PDF version of the Form 4689 down below or find it on the Michigan Department of Treasury Forms website. unless it is requested to remain confidential. Driver’s license numbers are automatically kept confidential. Check to request personal information be maintained as confidential.